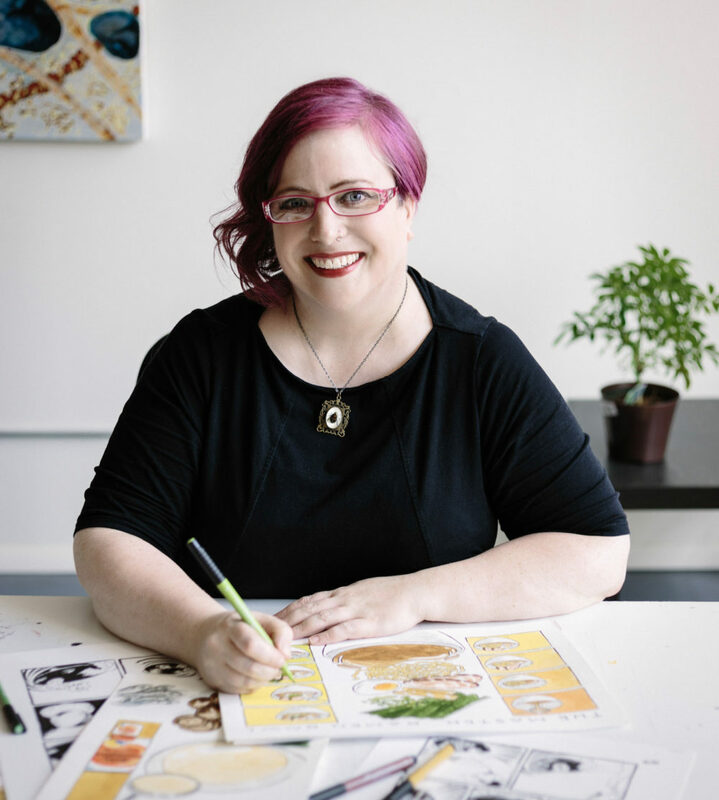 Sarah Becan is a comics artist, author, illustrator and designer, and the creator of “I Think You’re Sauceome”, a food-centric autobiographical webcomic. Her work has appeared in various publications, including Saveur Magazine, Eater.com, The Chicago Reader, TruthOut.com, and the collaborative serial collection Cartozia Tales. She was awarded a Xeric Award and a Stumptown Trophy for Outstanding Debut for her first graphic novel, The Complete Ouija Interviews, and her work has twice been nominated for the Ignatz Award. Becan’s second graphic novel, Shuteye, was funded with a successful Kickstarter campaign and released in early 2012. In 2014, she wrote and illustrated Luna de Cuernos, a long form graphic story for Fifth House Ensemble’s spring 2014 concert series. Becan illustrated the cookbook The Adventures of Fat Rice, published 2016 by Ten Speed Press, and is the illustrator of the forthcoming Let’s Make Ramen!, a comic book cookbook to be published July 2019 by Ten Speed Press. Sarah lives in Chicago with her boyfriend Niles.